Currently in the midst of giving a new-to-me stock X a makeover. I've got new tires on the way (Shinko 244's) and have moved on to replacing the rear sprocket. I know the common consensus 'round here is to go with a 13/48 setup but my new (taller) tires had me wondering what effect they had on gearing. Long story short... my brain damn near exploded and I'm now more confused than when I started. To get the desired effect of 13/48 with the taller tires do I go even bigger (50?) than the recommended 48 or smaller? A taller tire will give you taller gearing, but, in my opinion, just try it and then decide. I wouldn't be surprised if you feel it's just fine. 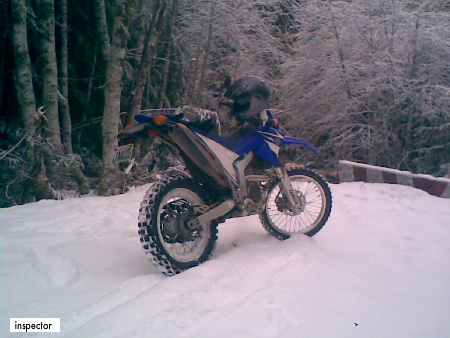 On my own WR250X, I used Michelin Pilot Power tires (it was a street bike for me) with 13/49 sprockets. I felt it was perfect for the bike. I did not measure or compare the circumference of the Pilot Powers to the original Bridgestone tires. Hopefully I'll like the setup with the taller(ish) tires. I just want a little more pep, I don't plan on doing too much highway riding with this bike. I've got a 50 tooth with the relatively tall Dunlop 606 rear tire. I use a 13t front for mild dirt roads and a 12t front for the steep, rocky, nasty stuff. 112 links, like you.